Binternet Review 2019: Is Binternet a Good Hosting? Hosting provider Binternet was founded in 2002 to offer internet solutions to small businesses based in Israel. The company is yet to make a substantial investment in hosting solutions but does provide an array of internet services including SEO tools, storage services, web design, and web development. Binternet is an Israeli web hosting provider. It was established in 2002 as a provider of internet services such as web hosting, SEO, storage services, backup services, web design, and web development. 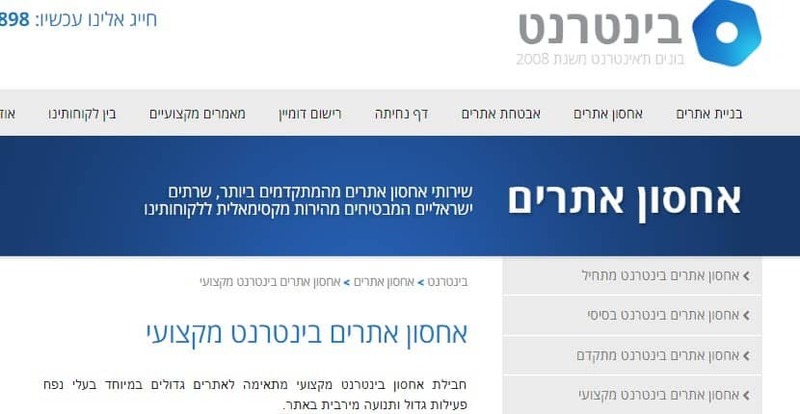 The Binternet website is only available in Hebrew. Binternet provides its hosting services from servers housed in Israeli data centers. They have invested in modern technologies and hardware for faster and more robust websites, and they offer free daily backups in case of disaster. A standalone WordPress security package includes features like blocking access to the admin system after three unsuccessful login attempts. While Binternet lists a considerable number of features for each of its hosting packages, it includes few details about the limitations of these features. It is also important to note that users whose websites exceed the agreed resource allocations are deemed to be misusing the vendor’s services, which could lead to suspension of services without prior warning! Binternet’s hosting prices (in Israeli new shekels) are in line with competing companies. You can choose to pay either six-monthly or annually (with a discount), and they have no setup fees. They offer a lower-than-usual 99% uptime reliability with no refund policy or money-back guarantee. While Binternet provides SSL certificates, this feature is not included in any of their hosting plans, so you have to pay for it separately. Customers can reach Binternet’s 24/7 support team by telephone, email or live chat. They have no ticketing system but they do respond quickly and knowledgeably to most hosting questions. There is no knowledge base or FAQ section. Although Binternet provides an array of internet solutions, this vendor is yet to invest seriously in the web hosting solutions that would make it suitable for big corporations. That said, they seem to have sufficient resources and expertise to provide excellent hosting for bloggers and small businesses. Wondering how Binternet stacks up against other Web Hosting companies? Enter any other Web Hosting company and we will give you a side-by-side comparison.